Behold, the new best team for p3. Never again will you spend 15 attempts on p4, this team usually only take 1-4. Gone are the days of geared zombies being useless in STR, because I assure you, she'll be more useful around G10 in this team. I hope you all enjoy this collaborative video I with Halfface, and I'm certain you all will be pleased. Seen two minutes ago, well done!!! Thanks andrea, I can't believe people are just scrolling past this tho.. 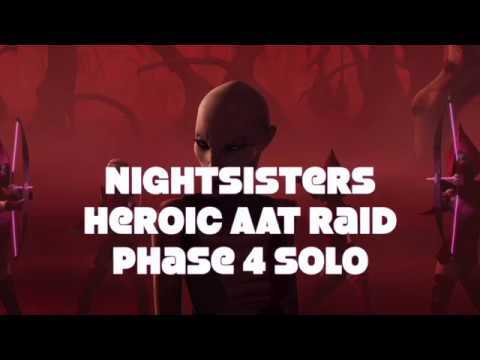 The problem is if you use your nightsisters for P3 then who are you gonna use for P4? It only takes about 10 NS teams to clear p4, leaving many more for p3. I didnt watch the whole video but the general strat appeared to be use a mt lead, initiate, daka, asajj & zombie. Let initiate & mt die, then use basic attacks on the boss with the others. Either initiate or mt rez, assist attack & die each time. It boosts daka's hp & her heals as a result. Asajj gets 35% tm each time plus offense, crit chance & hp increases. They were killing the swords using asajj's aoe. They had all the zeta abilities i believe. Edit: I think the damage was 23% of p3. Any rough idea on how the mods were set up on them? Without going into too much detail. Speed for zombie. Crit dmg for asajj. Defense/potency for daka. Offense for mt & initiate. The video gives a better rundown. Spirit would work better (more damage, 2nd negative effect is guaranteed to try and proc). Acolyte will do a lot more damage personally but doesn’t try to inflict any debuffs. NS gain 5% TM for each resisted debuff, so when initiate attacks she tries and fails to inflict 1-2 debuffs (2 on a Crit) resulting in 5-10% TM gain. Ventress gains 70% TM guaranteed and could possibly gain 5%-10% more if Ventress or Daka attempts a stun on their basic during each “rotation”. I’m too lazy to do the math to get the exact number, but each rotation the debuffs are the equivalent of adding a min of 17% speed to Ventress up to a max of 50% speed. I missed the part about the 5% tm gain but that makes sense. Thanks for the explanation. They better not. This is the basis of my p4 HAAT team. Not a big deal now but is still fun to use. If they were to screw this up I’d be ticked off. Not to mention it really would be the nail in the coffin for NS in arena. They have absolutely 0 basis to nerf this. This exact strategy has existed since NS came out. It’s not some trick that exists only in the Sith Raid. If they didn’t anticipate this they haven’t been paying attention. This is from November. My guild isn’t strong enough to do heroic yet, so we still run tier 6. I have noticed when I run this NS team, I’ll hit for 10-11mil if I’m starting at the beginning of p3, but only about 7 mil if I get a second crack at it the next day. Any idea why? Second- it’s called out above that about 10 NS teams are needed for p4, and only 3 for p3. Are you running this in p4? Or Ventress lead for her tm reduction with leadership? I seem to do better on p4 with Ventress up front.